Over the course of our marriage, my husband and I have established traditions that some might deem quirky. However, these unusual ways of celebrating people and seasons of life have become so meaningful, they are now woven into the rhythm of our family. For example, every year we share a glass bottle of Coke at Christmas to remember my great-grandfather, who collected Coca-Cola memorabilia. Before our fall schedules gear up and become too hectic, we set aside one whole day to build a blanket fort in the living room and spend the day watching movies together. For years before we moved from Kentucky to New Mexico, my husband and I would take a ‘prayerful vacation’ each summer. We would travel to a different place where we felt God might be leading us (Pennsylvania, New York, San Francisco, Virginia, Santa Fe), and we would spend a week getting to know the area and praying about whether or not it was where God wanted us. These aren’t exactly your typical family traditions, but I cherish them. For various reasons, all of our unusual traditions hold a special place in my heart, but our Easter tradition has become my favorite. In fact, I look forward to it all year. It’s a bit of a new twist on the traditional idea of gifting Easter baskets to your kids. You see, we don’t have children, and there are way too many youths in our student ministry to ever consider creating baskets for all of them. Though we do have two Beagles that I spoil each year with Christmas stockings, I just can’t bring myself to give them Easter baskets. Clearly, we have absolutely no reason to ever create an Easter basket—yet every year, we do. Back when my husband and I were young newlyweds, I read about a Christmas tradition that I really wanted to embrace within our own family. I asked my husband what he thought about doing something similar, and he suggested we try it for Easter. It may seem a bit odd to some, however, I believe we often miss out on what God wants to do in us and through us because we’re afraid of being seen as weird. So that year, we set aside those fears and began an unusual tradition which has provided years of treasured memories and has become our favorite. I believe we often miss out on what God wants to do in us and through us because we’re afraid of being seen as weird. Each year as Easter approaches, we purchase a simple basket and fill it with all sorts of goodies. Once our basket is ready to give away, we order take-out food to be delivered. While we anxiously wait for our driver to arrive, we can typically be found peering out the window like children watching for the first winter snowflakes to fall. When the delivery person finally arrives, we meet them at the door to receive our food—then, barely able to contain our excitement, we hand them the Easter basket. 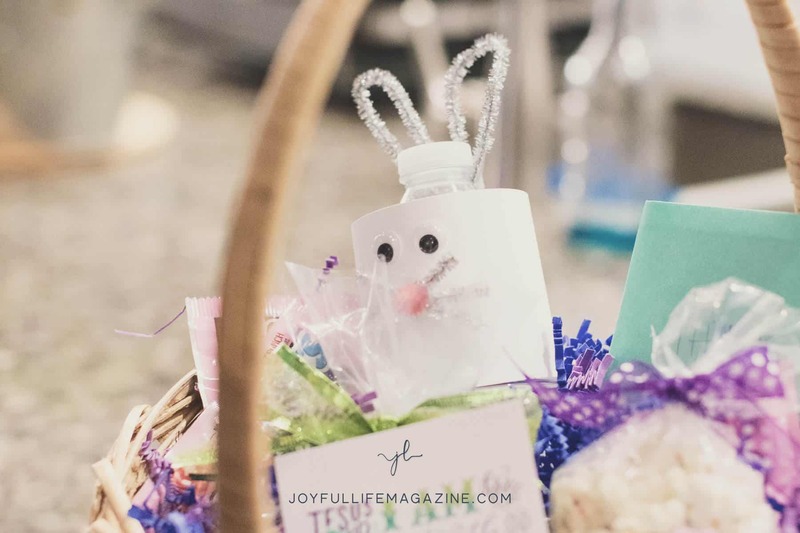 Essentially the basket is put together the same way you would create a basket for any child (an assortment of candy like a chocolate bunny, peeps, jelly beans, and so on). We always try to choose a gender-neutral basket. The first year, we bought a pink basket and had a male delivery driver, so that really was a little weird. We apologized and he laughed, but it was apparent that he felt a bit awkward as we watched him carry it back to his car. In addition to the typical assortment of Easter sweets, we also include a devotional book in every basket along with a hand-written card. Our personal preference is to select a funny one. We write a note inside which explains why we are doing this. The note says something like, “We think it really stinks that you have to work on Easter. We hope this little gift makes your day a bit better. Thanks for all you do!” We put our tip in the card, because while the candy is a fun treat, we realize they are not working for candy. We typically include a larger-than-normal tip as an unexpected blessing. We let them know their tip is in the card to be sure they don’t throw it away. I must admit, the first year we assembled the basket, ordered a pizza, and then freaked out. What would the delivery guy think? Would we offend him? This was so stupid! However, we had already bought and prepared everything, so we decided to just go for it. The delivery driver was a college student just a few years younger than us. We handed him the basket, almost apologetically, while trying to explain and stumbling over our words. Much to our surprise, he was so excited! He truly thought it was the best thing in the world! A few minutes after we had shut the door and began to enjoy our pizza, we heard another knock. He had come back to share with us that he had called his mom to tell her about the basket. She wanted him to thank us for her. He informed us that this was his first time being away from home on Easter, and it would have been his first year not receiving an Easter basket. With tears in his eyes, he told us that our little gift had made his Easter so much better. I shut the door and burst into full-on ugly cry. I never expected that kind of reaction! Another time that stands out was when our delivery driver looked like he belonged in a motorcycle gang—big, burly, leather vest, covered in tattoos and piercings. We almost didn’t give him the basket because we were so sure he would refuse to take it and think we were ridiculous. But, much to our surprise, when we handed him the basket he began to tear up. He explained that he didn’t have the money this year to buy his daughter an Easter basket. He said this basket was going to make her day, which in turn would make his day. Once again, I was a weeping mess. We’ve had a few people simply offer an uncomfortable “Thank you” and we do get the occasional, “Uhhh… okay” response, yet even still, we have never had anyone refuse to take the basket or say anything negative to us—which was exactly my fear when we started this tradition. Somewhere along the way, I began to realize that people typically react well to acts of love. We may hesitate to show extreme kindness because it is so counter-cultural, but that simply means people are that much more desperate for it. When we do face our fears, overcome our hesitancy, and follow Christ’s example of radical kindness and love, it usually goes far better than we anticipate. It may be unusual, unexpected, or even a bit odd, but that makes the blessing all the more abundant. Amber Nash lives in Albuquerque, NM with her husband and two Beagles. She enjoys helping her husband with his ministry as the Student Pastor at their church. She is passionate about helping people discover the fullness of God through discovering the entirety of their identity in Christ. How incredibly fantastic!! It’s not weird! It’s a fabulous idea! What a blessing you are. For a brief period in my life, as a single mom, I delivered pizza. I’d always greet them with smiles and found not everyone was as enthusiastic as I was! LOL. I love this idea! I will definitely be orchestrating this. Could do it for Thanksgiving or Christmas Eve too. I am a beagle mom too—to 2, like you. And I have a beagle in doggie heaven. They are simply the sweetest dogs!! My husband and I are now empty nesters, and we moved into a smaller house last November. So, to get to know our neighbors, I bought tins of cookies and then delivered them to nearly a dozen neighbors, along with a card stating we were looking forward to being their neighbors and getting to know them. Everyone was really touched by the gesture. I love your Easter basket idea. I enjoy giving and love unexpected and unusual ideas from people who enjoy it also. This is one to keep and do. Thanks so much !